I am someone with many diversions and infatuations, most of which seek to release the insane pressure of constant production. 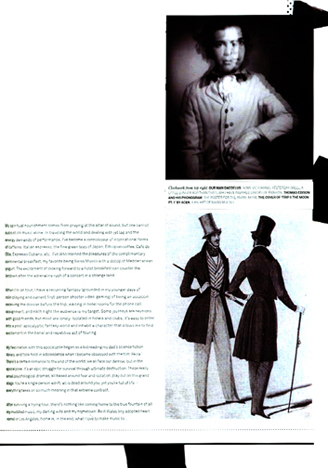 Take for instance my interest in Victorian fashion and its Dandy attitude - it is ridiculous to wear frock coats, high-wasted trousers, spats, top hats, kid gloves, etc. in the California sunshine, so much so that I think it makes perfect sense. Why not put on more than reasonable and slavish attire and adorn yourself in something besides what's easy? Well, that's what I'd like to think I'm doing; more likely it's just another earlier interest manifesting, the notion of invemtion (especially in the 1800s, hence the period pieces). Imagine if you will, a very small me, with no sideburns and the silly middle name "Alva." I liked terribly to take stuff apart, things that were not meant to mend afterwards. I knew of another Alva, Thomas Alva Edison, born in 1847, who (supposedly) invented the phonograph by the time he was 31. My parents had a nice 196s record player, and when I was old enough (strong enough) I destroyed it. They replaced it and made me promise not to repeat my tragic experiments, and it was then that I discovered a world of sound I hadn't previously been aware of... my parents' record collection included lots of 50s Doo-Wop, John Cage pieces and Musique Concrete. I became familiar with electronic sounds through my parents' odd ties and also George Clinton records (my godfather/next door neighbor's brother was George Clinton's manager) but I accidently stumbled upon a new sound from the UK when I bought a rave record simply because I liked the cover. It made me hungry for more, so I started collecting these sounds, which led me to the magic of Acen. I was suddenly a boy full of wonder, without ever having gone to a rave (...yet). To my young mind it was the cure for cheesy hip-hop or Guns 'n' Roses, but I felt alone in my passion for this music until a boyhood trip to the UK, where I heard the sounds in context on pirate radio, mixed and with overly chatty MCs. To this day I scour the land collecting records of a genre where sometimes there's fewer than 500 copies in existence, or perhaps only a test pressing. My spiritual nourishment comes from praying at the altar of sound, but one cannot subsist on music alone. In traveling the world and dealing with jet lag and the energy demands of performance, I've become a connoisser of international forms of cafeine. Italian espresso, the fine green teas of Japan, Ethiopian coffee, Café de Olla, Espresso Cubano, etc. I've also learned the pleasures of the complimentary continental breakfast, my favorite being Swiss Muesli with a dollop of Mediterranian yogurt. The excitement of looking forward to a hotel breakfast can counter the letdown after the adrenaline of a concert in a strange land. When I'm on tour, I have a recurring fantasy (grounded in my younger days of role-playing and current first-person shooter video gaming) of being an assassin, receiving the dossier before the trip, waiting in hotel rooms for the phone call assignment, and each night the audience is my target. Some journeys are reunions with good friends, but most are lonely. Isolated in hotels and clubs, it's easy to enter into a post-apocalyptic fantasy world and inhabit a character that allows me to find excitement in the banal and repetitive act of touring. My fascination with this apocalypse began as a kid reading my dad's science fiction library and took hold in adolescence when I became obsessed with the film Akira. There's a certain romance to the end of the world: we all face our demise, but in the apocalypse, it's an epic struggle for survival through ultimate destruction. These really small psychological dramas, all based around fear and isolation, play out on this grand stage. You're a single person adrift, all is dead around you, yet you're full of life... everything takes on so much meaning in that extreme contrast.